You know it’s a good night when you begin your major league pitching career by getting an at-bat before you even take the mound. And it definitely was a good night — actually, a great night — for Tyler Lyons in his debut last night as the Cardinals beat the Padres 5-3. Thanks to a lead-off walk to Matt Carpenter, an RBI triple to right for Matt Holliday, an RBI single by Allen Craig and an RBI double by Daniel Descalso, the Cardinals were leading 3-0 when Lyons strode to the plate in the top of the first inning. There were two outs, the bases were loaded and it would have been a true fairy-tale moment if that 2-1 fly ball to left had dropped in for a hit instead of into Jesus Guzman’s glove. In the sixth inning, again up with two outs but the bases empty, the liner to left was a base hit — take a look. Also a hit, in a different sense of the word? Lyons pitching. Seven innings, four hits, one run on a homer to Jedd Gyorko in the seventh, one walk, four strikeouts. Given the other Cardinals pitching news of yesterday — Jaime Garcia out for the season for shoulder surgery (gee, what a surprise he needs surgery …) and Jake Westbrook experiencing more elbow discomfort — Lyons was a terrific boost. Of course, is the fact a rookie Cards pitcher does well even a surprise anymore? 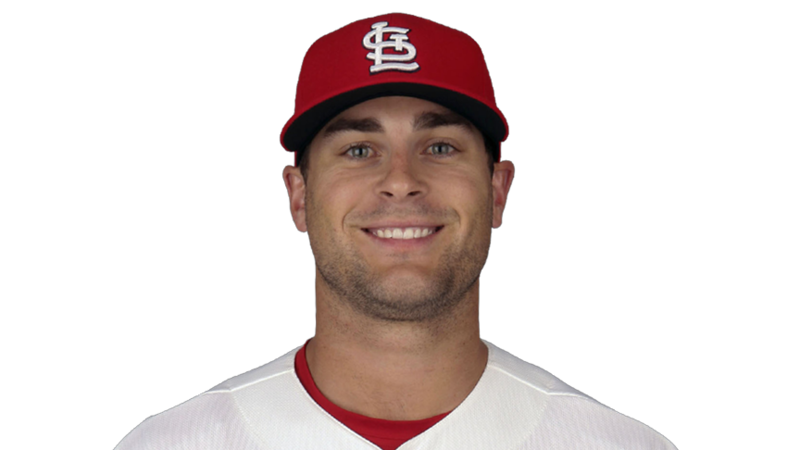 Lyons’ win was the 11th by a rookie this season, to go along with the five by Shelby Miller, three by Seth Maness and two by John Gast. And the Cardinals win was their 30th this season, making them the first National League team to 30 wins on the same day the Texas Rangers became the first American League team to that total hours earlier. The Rangers have 17 losses, though, so that Cards have the better record at the moment — if you’re keeping track. 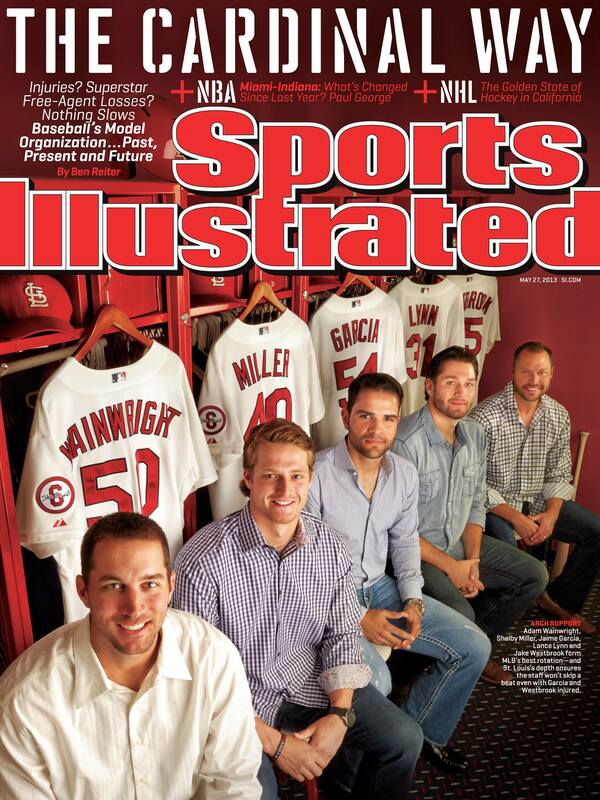 And doesn’t the fact two-fifths of that cover photo is on the disabled list yet the Cardinals still lead the majors in pitching with an overall 3.16 ERA and starter ERA of 2.61 just make the point even more? The offense too is continuing its success — the team is currently third in MLB and second in the National League behind the Giants with a .269 batting average after last night’s 14 hits. Four of the hits were from Yadier Molina, to raise his average to .333, and three were from Carlos Beltran, who’s now hitting .305. Allen Craig is just behind him at .304 (plus is fifth in the NL with 32 RBI) and Matt Carpenter is hitting .300. So far, just like Tyler Lyons’ debut, the results of the 2013 season are everything we could ask for and it really can’t get much better than this — even with all the challenges thus far and, of course, still ahead. There’s no post-season prize awarded on May 23. Time to just enjoy the ride.